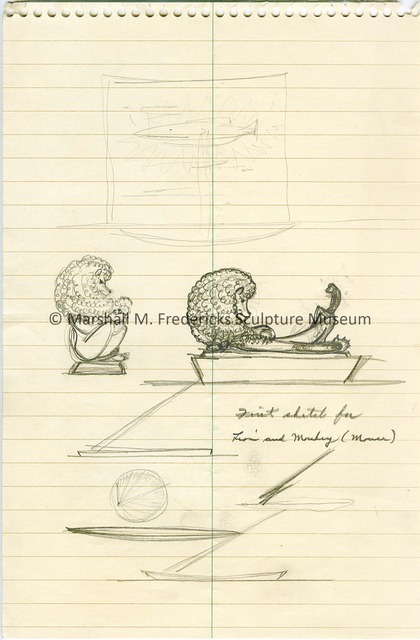 Marshall M. Fredericks Sculpture Museum | Sketch for "Lion and Monkey"
The Lion and Monkey does not remind us of Aesop’s (c. 620 - c. 560 B.C.E.) fable The Lion and Mouse, but rather tells a different story. The monkey is relaxed and at ease with his back arched and his tail resting on the lion’s leg; he might even be contemplating a nap. The lion too is relaxed, and lying on his back in a pose of submission. There is no danger here, only a glimpse at a moment of serenity, balance and harmony. Fredericks, Marshall M., 1908-1998, “Sketch for "Lion and Monkey",” Marshall M. Fredericks Sculpture Museum, accessed April 25, 2019, http://omeka.svsu.edu/items/show/6234.